It sure doesn’t feel like December has 31 days. There are the happy distractions of the holidays. The stress, exhaustion, and illnesses of the season. Then, everything shuts down the last week of the year. And before you know it, December is done! So, to help you make the most of this month, here are my suggestions of the top tasks to tackle in December. As a new manager, I once inherited my predecessor’s delivery schedule which included a major product due by the end of the year. My team and I ended up working while there was a company-wide party going on all around us. Granted, we took some time off to enjoy the festivities, but I also took work home over the holiday. Not fun. 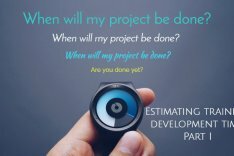 With any luck, you’ve been able to avoid having projects due in December. But, if that’s not the case, do what you can to wrap things up before the holiday break. Consider scheduling some late nights or early mornings, with all hands on deck. Provide dinner (or breakfast), put on some good music (if that helps), and get ‘er done! It’s best to front load these long days in the beginning of the month. At the very least, get the project to a stable position and leave a lot of breadcrumbs so your team can pick right back up in January. You might have already started this during fall planning. If not, now is a good time to pull together a bird’s eye view of the coming year. Start with the projected release dates of your company’s products. 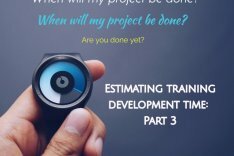 Schedule your training development projects to align with these releases. Add in conferences and other user events your company is hosting or attending. These are excellent opportunities to learn about training needs and offer classes. Lastly, sketch out your first week of 2017. The end of the year should be spent enjoying friends and family and downtime. I find nothing helps me do that more than knowing my first days back are already planned out. 1. Reserve your conference rooms! Finding a space for your meetings can be a real challenge. Reserve your room now while everyone else is having brain fog from all the cookies in the kitchen. Ideally, after every project, your team will have time to purge any material that is no longer needed. If deleting is too permanent, package everything up into one directory and archive it. If you can’t do this after every project (or if there is already a backlog of bloat in your CMS), then block off time in the calendar to devote to the task. Get the whole team involved — many hands make light work! High performing teams need both individual and team feedback. How were your training programs received? What impact did they make on the business? Were there failures? How can you fix or avoid them in the future? What processes and practices are working? Which need improvement? Consider doing this either as a team or ask for individual input in your 1-on-1 meetings. To get the fullest picture of your performance, get feedback from your management chain, other managers, your clients, and your reports. Help your team be candid by providing ways to submit their feedback anonymously or through a manager from outside your department. End of the year evaluations are a great time to discuss individual and team professional development goals. If you hope to attend or send employees to a conference, it pays to plan ahead. Early bird registration and member discounts offer the biggest savings. Check out my list of 2017 conferences. Or, better yet, subscribe to my email list and I’ll send you a handy printable version that includes costs and discounts. I hope this helps make your December more productive. How about you? What are your December routine tasks? I’d love to hear from you in the comments!